Egypt has reportedly ordered Sukhoi Su-35 multi-role fighters from Russia for an estimated $2 billion. This is according to Russian newspaper Kommersant, which has reported that the contract involves several dozen of the fighters, which will supplement the MiG-29M/M2 fighters it is receiving and help replace obsolete MiG-21s and J-7s. As its sources, Kommersant cited two defence industry executives, who said that Egypt will be getting at least two dozen Su-35s after an order was placed at the end of 2018. Deliveries are due to take place from 2020/2021. The aircraft will be built at the Komsomolsk-on-Amur Aviation Plant. Egypt’s order was apparently spurred on by the performance of the aircraft over Syria, where it was deployed by the Russian Air Force. Both China and Indonesia have ordered Su-35s, with China receiving its last batch in late 2018. 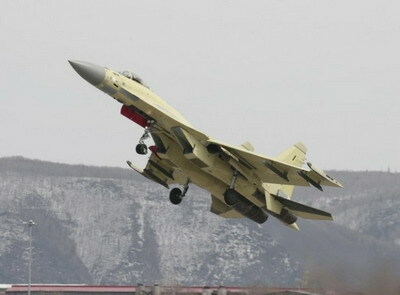 Indonesia has ordered 11 of the type and China 24. The Su-35 is one of the latest evolutions of the Su-27 ‘Flanker’ and first flew in February 2008, after which it was put in production for the Russian Air Force – service entry was in 2014. Compared to its predecessors, the Su-35 features new avionics including the Irbis phased array radar with a range of 400 km and more powerful AL-41F1S engines (14 500 kg of thrust) with thrust vectoring control. The aircraft has a maximum takeoff weight of 34 500 kg and a maximum range of 3 600 km on internal fuel. Payload is 8 tonnes on 12 hardpoints in addition to a single GSh-30-1 30 mm cannon. The Su-35 can deploy air-to-air missiles of up to 300 kilometre range, and can carry the heavy Oniks anti-ship cruise missile, as well as a multitude of air-to-ground weaponry. Over the last decade, Egypt has taken delivery of large amounts of hardware from Russia. According to the Stockholm International Peace Research Institute (SIPRI), this includes Tor-M1 (SA-15), Igla-S (SA-24), S-300VM (Antey-2500/SA-23) and Buk-M2 (SA-17) surface-to-air missile systems, ten Mi-17V-5 helicopters and a Project 1241/Tarantual fast attack craft as well as air-to-air and anti-tank guided missiles. Egypt is also receiving 46 Ka-52K attack helicopters and 50 MiG-29M/M2 fighter jets from Russian manufacturers.